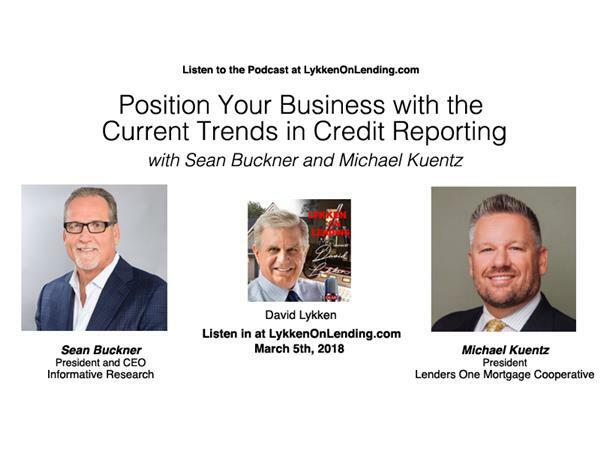 In this episode of Lykken on Lending, David interviews Sean Buckner, President and CEO of Informative Research, and Michael Kuentz, President at Lenders One Mortgage Cooperative as they discuss how to position your business with the current trends in credit reporting. There's been a lot taking place in our post-Equifax-security-breach world, particularly in the mortgage industry. It's a topic that is of high concern to everyone handling sensitive information with a priority of ensuring our best practices for our customers.